A Yamaha V Star Motorcycle for our Toad! Or maybe for those times when she'll want to go do one thing and I'll want to do another. Just because we're living together in a fifth wheel doesn't mean we have to be together 24/7! Having a little flexibility can help keep the peace out in the boondocks! An RV scooter would give me a way to get out of her hair for a while! Let's face it, cruising a nice bike down a mountain road is the next best thing to being horseback, on a fine horse, in far country. Sort of an iron horse! A lot more accurate than when they called the early locomotives the "Iron Horse". Kind of fitting for a cowboy too! Considering we'll be in a fifth wheel it sure limits the vehicle options anyway! It's not like we could reasonably tow a car behind the fiver ............... at least we can't in enough states to make it a no go for me. And towing double is just too much of a hassle for me to think about it much! So I figured on a smaller, used cycle that could be slung on a rear mounted motorcycle carrier. That means, to me, a bike under 500#. The more I thought about it, the more I decided that I really had little intention of a lot of "dirt" riding. And the idea of bangin' a screamin' dirt bike down the pavement for 50 miles to go fishing quickly lost it's luster for me! So I started looking at road bikes under 500#. The 250cc. sized bikes are OK, I guess, and only about 350# or so. But, when your ego is a mite oversized, those little bikes just don't shine too much either. That and I'd like to get the missus to take an occasional ride with me ................... let's just say the two of us trying to balance on a 250cc scooter would give the neighbors something to giggle about for a while! That said the only thing left is basically the 600cc. class. The cafe racer/sport type bikes don't toot my whistle, so that narrows it down to the cruiser style of bike. What would the Fonz choose? Yep, a cruiser bike! 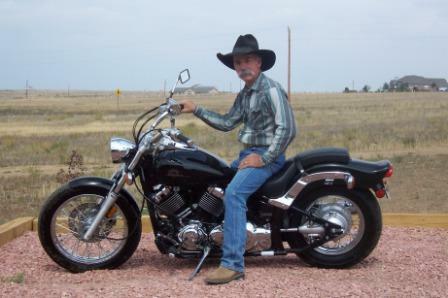 So what else could a cowboy, deeply concerned with maintaining his image ride?! Another no brainer! Looked around here and there. Bought a few motorcycle trader magazines, no luck. Finally someone put me onto "Craigs list". I think it may have been my daughter. Thats where I found this bike. 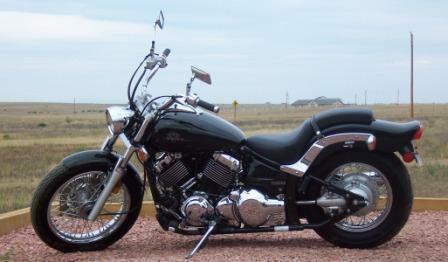 Right there in the motorcycle classifieds on Craigs list... 2001, Yamaha, V Star 650. Pretty slick. Just key in V Star and every ride with that description in the Denver Craigs list (the only Craigs list near us) popped up. Good pictures and all. She was clear down in Castle Rock. ( the other side of Denver from our current digs) But good things should take a little effort, right? So down to Castle Rock I rolled. Saw the bike. Knew it was the right one, right quick. Made the deal. Time to take her home. Now, how does one awful pretty girl (the previous owner) and one old cowboy get a 500# Yamaha motorcycle 3 feet off the ground and into the back of Big Red? ...................... would have been fairly smart to have thought that one out before I bought the motorcycle, don't you think? But that wouldn't be me would it?! Crisis management is what some folks call it. "Cleaning up another one of your messes eh?" is what my wife calls it. Couldn't locate a dirt bank to use for a loading dock, no good way to rig a ramp, ................ finally, I had the bright idea of taking it to a local dealer and enlisting their aid. Kelley (the awful pretty girl) made the call to the local Yamaha dealer in Castle Rock, Colo. and minutes later the Yamaha Motorcyle dealers people were forklifting my "new" bike into the back of Big Red. Slick! Wasn't nothin' in it for them but they were quick to help just the same. (they tried to refuse a token "tip" but being the stubborn old coot I am, they failed!) So if you need something motorcycle related, you might give the Yamaha dealer in Castle Rock, Colorado your business! They seem like pretty good folks. Tell me I didn't have a mile wide grin, rollin' through rush hour traffic in Denver, headin' home to Nunn, with that Yamaha Motorcycle in the back of Big Red, and I'd have to call you a mite dishonest. I was a happy camper for sure and for certain! Next thing to do will be to get a receiver hitch installed on the tail of our Jayco to hold the motorcycle carrier for transport. I'm pushing the envelope here a bit. But I think, properly done, I'll have a reasonable, workable solution for carrying the bike without a second trailer. I've had a good fabrication welder referred by several people so that project is in the works. No time to waste! Never know when this house will sell and everything needs to be ready to go! Including that Yamaha V Star Cruiser!